February is Dental Health Month! Explains Dental Disease. February is Dental Health Month! 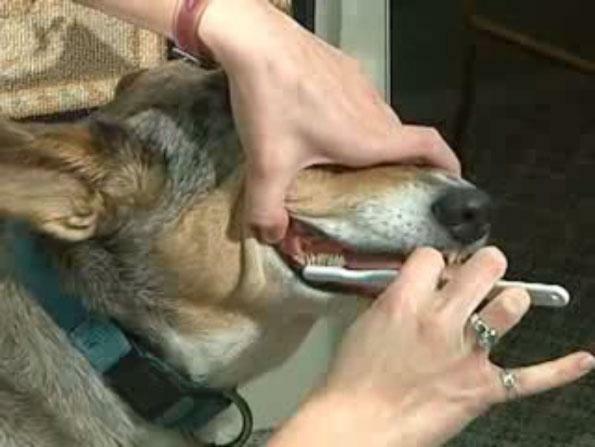 Coventry Animal Hospital Explains Dental Disease. Many pet owners don’t realize how important a healthy mouth is to their pet’s overall health. An unhealthy mouth can affect the way major organs function, including the liver, kidneys and even the heart. Simply put, cats and dogs with clean teeth tend to live longer. 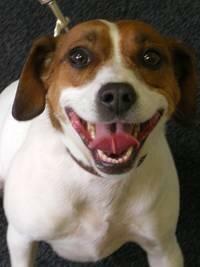 Coventry Animal Hospital offers insight on the basics of dental disease in pets and what you can do to prevent it. How common is dental disease in pets? Unfortunately, dental disease is a very common problem for pets. By the time they celebrate their third birthday, 80% of dogs and 70% of cats have some form of dental disease. The good news is, your pet doesn’t have to be one of these statistics — with a little extra effort you can prevent many common pet dental problems. Bad breath may be the first sign of a dental problem. So what causes bad breath? When it comes to bad breath, (ours or our pets) you can blame bacteria. Bacteria are normal inhabitants of the mouth and they cling to the teeth forming an invisible film called plaque. Even though you can’t see the plaque, you can definitely smell it. While doggie breath may not be particularly sweet, it should not be noxious or foul smelling. If your pet’s breath has a really bad odor, something is wrong. Bad breath is often the first indication of dental problems and one that pet owners notice right away. All pets and people develop plaque on their teeth, but some of the plaque is removed by daily activity. When the dog eats crunchy foods, some of the plaque is removed from the flat chewing surface of the teeth. As the dog moves his tongue around inside his mouth, more plaque is removed from the inner surfaces of the teeth. Your pet can take reasonable care of the chewing surfaces and inner surfaces of the teeth, but they usually can’t keep the outer surface of their teeth clean. Have you ever seen a dog or cat lick the outer surface of his teeth? To remove this plaque buildup, pet owners need to get involved in their pet’s dental care. What can pet owners do for their pet’s dental health? First of all, pet owners can brush their pet’s teeth with specially formulated toothpaste. People who brush their pet’s teeth need to remember this: Only use pet approved toothpaste that contains enzymes to break down the plaque. This toothpaste is made to be swallowed and won’t upset the stomach like human toothpaste can. Plus, it’s flavored so pets don’t mind brushing so much. Brushing your dog’s teeth 2 or 3 times a week will reduce the accumulation of plaque and the associated odor. In addition to tooth brushing, you can add an anti-bacterial supplement to the water bowl. These additives reduce bad breath by decreasing the number of oral bacteria the same way human mouthwashes do. Like pet toothpaste, this product is meant to be swallowed. Start by adding just a few drops to the water bowl and gradually increase to the prescribed amount to help your pet adjust to it. Plaque-fighting water additives are really useful when pets object to tooth brushing. There are also many varieties of dental chews available that help reduce plaque. Some work by an abrasive mechanical action and rub the plaque off as the pet chews the treat. Others include a chemical called chlorhexiderm that acts as a disinfectant much like the water additive. What happens if plaque builds up? If plaque is not removed, it not only causes bad breath but as it thickens and turns into tartar. Plaque may be invisible, but tartar is not. You can see tartar as the brownish-yellow substance that accumulates on the surface of teeth. Tartar tends to appear on molars (the teeth in the back of the mouth that are used for chewing). Since few pet owners raise their dog’s lips to view these teeth, tartar often goes unnoticed until it affects more visible teeth like the canine teeth or the incisors. Even though you can see tartar on tooth surfaces, what you can’t see is the accumulation beneath the gum line which causes an inflammation of the gums called gingivitis. The presence of tartar usually indicates the onset of gingivitis. Gingivitis is an inflammation of the gums caused by the bacteria that surround the gum line. Gingivitis results in red, swollen, painful gums. When left untreated, gingivitis can result in a more serious form of dental disease called periodontal disease. This advanced stage of dental disease occurs as bacteria erode the connective tissues that hold teeth in place. Both soft tissue and bone can become so deteriorated that teeth become loose in their sockets. Dogs with periodontal disease lose their teeth earlier than normal and are often in pain. How does oral disease affect other parts of the body? Sometimes periodontal disease becomes so severe that the bacteria in the mouth erode the barrier between the nose and respiratory passages resulting in an oro-nasal fistula (hole in the hard palate connecting the nose and mouth). Bacteria are then free to invade the nasal passages and/or sinuses causing respiratory infections which require medical intervention. Inhalation pneumonia can also result from food literally being breathed into the lungs. In addition to respiratory problems, the bacteria in the mouth can cause trouble in other organs as they travel beyond the respiratory passages. Bacteria can enter the blood stream through the small blood vessels in the mouth and circulate throughout the entire body. Blood-borne bacteria can affect major organs, such as the kidneys and liver, and bacterial accumulation on heart valves can cause a heart condition known as endocarditis. During a dental cleaning at a full service clinic such as Coventry Animal Hospital, your pet is anesthetized to prevent it from wiggling around, control its pain and protect its lungs respiratory system from inhaling bacteria. A registered veterinary technician or veterinarian will probe the gum pocket to check for deep pockets that indicate disease around the tooth. If the pockets are small, scaling the teeth clean may be adequate therapy; but in more advanced cases surgical extraction is warranted. Root canals and complicated orthodontic cases are performed by a veterinary dental specialist on a referral basis. Teeth are polished and fluoride is applied. When the pet wakes up, it may have to eat softened food for several days, as the gums are tender. 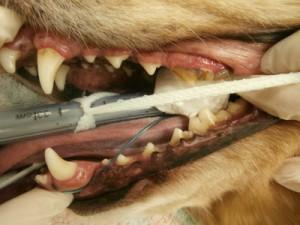 If teeth were extracted, the pet is sent home with pain medication. Home dental care and strategies to prevent dental disease are discussed during a post-operative visit. It’s never too late to make the decision to control dental disease in your pets. Coventry Animal Hospital encourages you to ask us about dental cleanings for your cat or dog in order to maximize a healthy, pain-free life for your pet.